Through economic hardships, there is much to be thankful for. 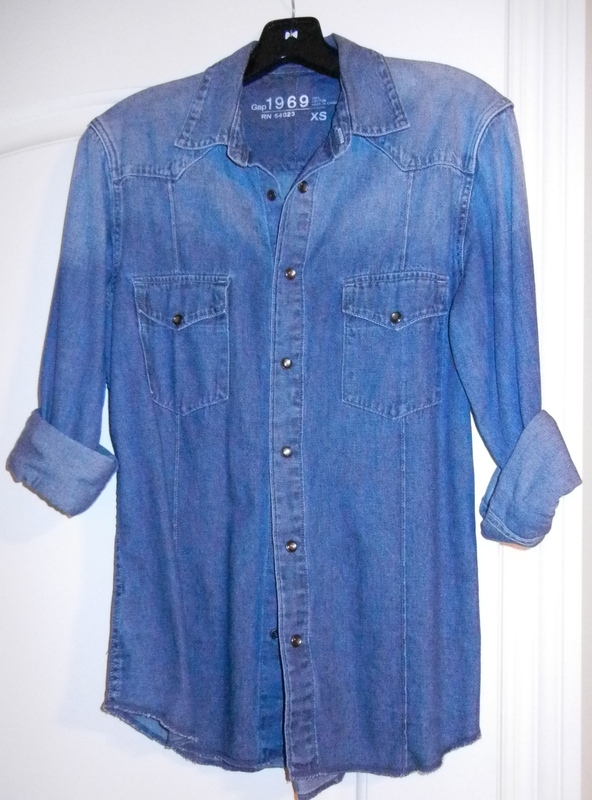 This denim button-down shirt may not look like much but it came from a friend I knew in college. To this day, I’m still baffled as to how I ended up with it in my possession. He threw the shirt at me when I ran into him one Friday in my second year of university and declared very loudly, which was uncharacteristic of him, that he didn’t want it. He spent the rest of the time almost yelling his answers at me in a crazed manner. I avoided saying anything that would offend him before excusing myself for a meeting I was late to. Later, the school paper published an incident article with his name and major, saying that he knocked on a random resident’s dorm room door and proclaimed that he was suffering from AIDS. He was described as being delirious and very out of it, so much so that he had to be taken to the hospital. I never saw him again after that day. I remember being angry at the school paper and left confused as to what was happening to him and why the change in attitude. My friends claim that I don’t want to know what happened, nor do I want to even try contacting him through social media. He used to be known for being fun-loving, a joker, and very laid back. Unfortunately, the incident has branded him an unstable, crazy student who was a nuisance. I haven’t worn this shirt in a long time. I almost put it in the donate pile but I found myself putting it back into my closet. Posted in Media, Original Writings and tagged clothes, clothes can tell a story, economy, NaBloPoMo, stories, yoursmileispriceless. Bookmark the permalink. But I’d probably be the next one, wouldn’t I? Posted in Original Writings and tagged economy, flirting, NaBloPoMo, not a good match, Not That Girl, original poem, poem, relationships, yoursmileispriceless. Bookmark the permalink. Did you ever have an idol in some kind of sport growing up? Mine was Michelle Kwan the figure skater. I didn’t envy her rigorous schedule filled with training and little time for rest but I was amazed when she could do all of the amazing moved effortlessly on ice. I guess I also admired her for her boldness – she dared to go out for the senior level figure skating behind her coach’s back and succeeded. As for me, ice skating is still a long way to go – I haven’t gotten past the stage where you shuffle around the rink and clutch onto the edge for support. Despite the fact that she is younger than me, I think one of the athletes I admire at the moment is Mckayla Maroney. While she is mainly known for her infamous expression after failing to win gold in the individual vault during the 2012 Olympics, I can’t forget the amazing vaults she performed for the team medals. The commentators mentioned that she managed to achieve a great height for her vaults and had some strong landings, which led to good scores. I used to cringe whenever I watched the US artistic gymnastics team vault back in 1996, especially when Dominique Moceanu fell on both of her vaults on her behind and when Keri Strug was injured in the first vault. The falls looked painful and it seemed like the vault was tricky to simply get over and land without difficulty. For someone like Mckayla to make these vaults look effortless, almost old hat, is amazing in my mind. Do you have a favorite athlete you admire? Posted in Original Writings and tagged 2012 London, artistic gymnastics, economy, favorite athletes, figure skating, Mckayla Maroney, Michelle Kwan, NaBloPoMo, Olympics 2012, yoursmileispriceless. Bookmark the permalink. A photographer from Russia named Alexander Khokhlov photographed models with impressive make-up transformations that turned them into living works of art. Some of these looks left me shocked and wondering whether he really had some talent apply the make-up or whether this was some really good PhotoShop work. Posted in External Research, Original Writings and tagged art, economy, make-up, make-up art, NaBloPoMo, yoursmileispriceless. Bookmark the permalink. Say What? Bloodsuckers are Still Hot? Prior to reading Twilight at the urging of my friends, I noticed that there was quite a few vampire novels out there, minus the original Bram Stoker. I will admit that I did read the Darren Shan saga, Vampire Kisses series, and one novel titled Demon in My View because the idea of immortality was intriguing. Why are we so fascinated by the concept of being able to live out a longer life? Also, why do we like the idea of having the undead cross paths with the mortal world? Maybe we wish that we could keep living throughout history and be able to recall periods of turmoil and prosper without too much difficulty if asked later down the road. Or perhaps it is the romantic notion being able to defy the logic and reality of living a short life. What does surprise me is the fact that the TV series like True Blood and The Vampire Diaries as well as the book series turned movie property Vampire Academy are still holding an audience of captivated fans who back up the bloodsuckers to this day. Posted in Original Writings and tagged bloodsuckers, economy, NaBloPoMo, vampires, yoursmileispriceless. Bookmark the permalink. It seems to me that quite a few people I’ve crossed paths with have been told this at some point in their lives. Some of them defied the people said they couldn’t do something and others shied away from the said thing because of something someone said. As for me, I’ve been told that I’ll never be in any type of performance, especially one which involves me trying to make people laugh or one where I take on a role of someone else to entertain an audience. Which I feel is true – the only time I’ve ever made people laugh is whenever I’ve said a slang phrase or term that is more fitting for the 1950s-60s than the 21st Century or maybe if they see me make a face. Humor doesn’t come naturally to me and frankly I don’t understand it very well. As for acting, the only time I have stepped into that light is when I had to do skits in my language class. Mind you, some of them ended with humor while others, especially one with a waiter who insisted on changing his voice every sentence, were downright weird. What about you? Would defy the naysayer or do you find yourself agreeing with them? Posted in Original Writings and tagged comedy, economy, entertainer, NaBloPoMo, you'll never, yoursmileispriceless. Bookmark the permalink. It’s rather funny to see the entertainment sites talk about celebrities bashing each other and how they react. With all of the talk about people like Lorde voicing her opinion on her fellow singing peers and Taylor Swift taking a stab at her exes through song and concert, there’s always something to talk about. To some, the stories present the celebrities instigating the taunts to be either a bad guy or childish. The attitude of the celebrity seems to color the story the most, especially with how the taunt or insult is delivered. While I don’t always agree with a majority of the bashing, it makes me wonder why some famous people do it. Could it be for shock? For attention? Or simply to express their opinions with everyone? Posted in Original Writings and tagged celebrity, economy, insults, NaBloPoMo, yoursmileispriceless. Bookmark the permalink. Hype Resell: Business or Avarice?